“Everyone bonded with each other who could skate and we were complete pricks to people that couldn’t,” goes Tas Pappas; one half of the ill-famed skateboard duo the Pappas brothers. And as far as All This Mayhem (2014) is concerned, this puffed-up bluster of his is patently true. Reeling footage of short-tempered thrashings from the halfpipes to the suburban gullies of a socially reductive Australia make up almost the entirety of Eddie Martin’s documentary. In initiated circles, both Tas and his brother Ben were maniacal miscreants; hellbent on relieving their asphyxiation with chaos and shattering the vertical skateboard scene with the swipe of a fist. 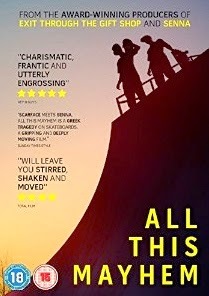 Produced by Vice Films and distributed through FilmBuff – the heads behind Asif Kapadia’s celebrated biopic Senna (2010) and Banksy’s divisive ‘prankumentary’ Exit Through the Gift Shop (2010) – Martin’s tale follows along the accustomed thematic traits of its predecessors. Upstarts driven almost to insanity by the fire in their bellies and the creative flair (or sometimes lack of it) that sparks it. The movie assembles infinite hours of home recordings and hand-shot footage of the brother’s ascension from their deprived backgrounds to the inevitable conquering of the sport. The result is a collated paean of boyish ambition and crude idealism with reprehensible circumstances. Indeed, All This Mayhem preens itself as the typical fabling of the American Dream told with unforgiving ferocity. Extreme and tragic, this is the story of two wily brothers who travelled to the US in the 1990s ready to outrun and outfight their skateboard contemporaries. They did. Then, much akin to the ‘live fast, die young’ mantra, the tyrannical pair fell deeply into drugs and other outwardly defaming activities. As their blind hooliganism escalated, their careers dissipated. Frequently ignored by their counterparts whom were slightly busy with the abounding success of the so-called US darling of the scene, Tony Hawk. Similar to Bart Leyton’s masterfully disconcerting, The Imposter (2012), Martin permits the imbecilic absurdity of the brothers’ lives to mould the narrative. Yet, much like Leyton, the director insists on opening debates on contrary subjects, which are hardly informed or supported by anything other than suggestion. This leads to perpetual lack of objectivity and mindless finger-pointing. Martin allows his subjects to ask the questions, but sometimes the answers feel totally unfounded on anything other than bias opinion.